Spacious family villa, near the city with tennis court near by! The villa is located in the very popular area Stocksund (in Danderyd), just north of Stockholm. 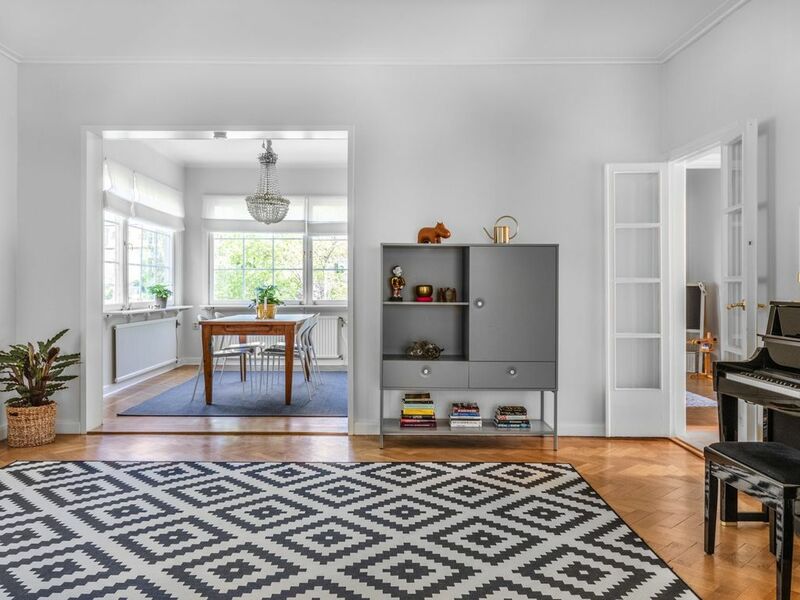 Vicinity to the city, Arlanda Airport, the sea, nature, jogging trails, restaurants and much more makes it the ideal house. 10 mins by car in little traffic, 20 mins during rush hour. Det tar ca. 10 minutter at gå til den lokale toget (Roslagsbanan) i byen, eller 15 minutter til metrostationen (metro), som forbinder hele byen. It is a fairly large house, over 4 floors (including basement), with a total of 10 rooms, of which up to 6 are bedrooms. En af soverommene er i kælderen, og en på loftet. Please let us know your needs in terms of beds so we can plan together accordingly. The main floor is perfect either for just being home or for entertaining and having friends or associates. The living and dining rooms are both large and easy to host visitors within. There is a functioning four-place. The kitchen is rather spacious as well, with a good sized dining table which easily seats 6 people. On this floor, there are also two bathrooms, of which one is bigger, with a comfortable shower. This is perfect for the decorated guest room (or office for those who prefer) just next to the kitchen. This floor also hosts an additional room, which we currently use as a play-room, but could potentially be used for additional beds. The second floor is the ideal private area, with 3 good bedrooms, and a large bathroom (somewhat dated) with both shower and bathtub. Here you will also find the combined washing and drying machine. On this floor there is also a balcony facing trees, the skies and the other beautiful surrounding villas. The attic is a little like a separate entity, which is a small living room and a bedroom - perfect for guests or maybe teenagers. The basement also has one bedroom as mentioned above. In de kelder is er ook momenteel een muziek-kamer, met drums, piano, gitaren etc, evenals een sauna en douche. The section is quite big, more than 1000 square meters. Det har et stort grønt område som vender ud mot gaden, med flotte omgivelser for børn, som for eksempel en sving og også slides. There is also a play-house, as well as outdoor furniture and a gas BBQ for great dining evenings. Overall a fantastic house and we love it. The house has been installed with high power (3-phase) power plug for electric cars, such as a Tesla.